How to check that the quotation has been updated with new product price or where the revisions are created? It’s very simple, you just have to explore the ‘Quotation and Invoices’ module and you can see all your quotations there but if the ‘Update Existing One’ option is selected then you certainly know the only quotation with the name has been updated with the new value. Now the question arises as to where would be the revisions be saved and how to identify them? 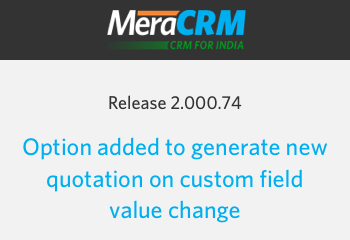 So, as the promise of MeraCRM goes that convenience and customer satisfaction is the most critical aspect there has been provided an easily visible way to identify the revisions where besides the name of the quotation, is the revision number. Now, if all the revisions are working then anyone can update any revision and then the confusion would arise but since for MeraCRM convenience comes first, a facility has been provided where only current revision would be active else all would be inactive and locked. Also, the quotations are linked to lead and any changes in quotation would be also reflected in the lead module. Hence, the MeraCRM believes in changing with the time and also needs of its user.